“Each year, 29,000 premature deaths, mostly from strokes and heart attacks, are caused by air pollution. This is greater than those deaths triggered annually by obesity or passive smoking . . . For years, the EU has been warning Britain that it faces being fined £300m a year for failing to make drastic reductions in levels of airborne particulate pollutants emitted by cars, lorries and factories”. 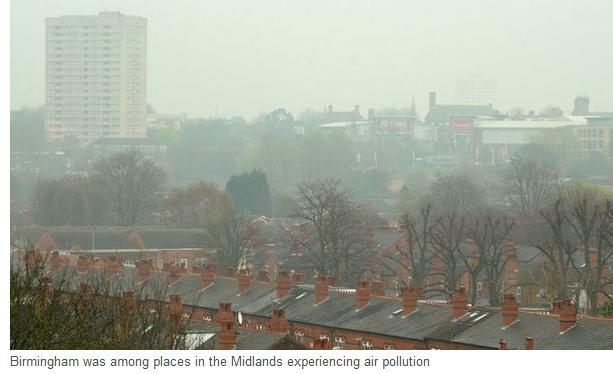 The latest BFOE newsletter reports that, as part of their “Let’s Get Moving Campaign”, some BFOE members have been collaborating with local primary schools to measure air pollution in Birmingham for the Citizen Science Project. The results of their experiments clearly show a link between busy roads and dangerous Nitrogen dioxide (NO2) concentrations, with some areas exceeding legal limits. They worked with the children to predict air pollution levels in the area that they wanted to test, considering factors such as road size, location of open spaces, train tracks and factories. To test these predictions, measurements were taken of NO2 levels in locations which experienced differing levels of traffic intensity. The investigations used diffusion tubes to measure the concentration of NO2 in the air. The small plastic tubes contain a chemical reagent to absorb the pollutant to be measured directly from the air and are gripped by a sturdy plastic holder and attached to an appropriate substrate in the area, out of reach. Once set up, these diffusion tubes were left for a two week period. Following retrieval, the tubes were sent for analysis in a laboratory. and using public transport, as buses and trains carry more people than cars. They also discussed the potential of electric cars to reduce emissions. In the short term, they decided that they would avoid the busiest (and most polluted) roads by walking on quieter roads, to decrease the amount of air pollution they breathed in. Conclusion: It seems that air pollution is a city-wide problem! Local and National Government need to take action. Successive governments, both Labour and Coalition, have simply ignored these warnings, an attitude that the cross-party environmental audit committee has since described as shameful.